Chriszanne Janse van Vuuren of the Southern Cape Land Committee, which fiercely opposes fracking. When the threat of shale gas fracking first loomed over South Africa’s Karoo region in 2011, most of the opposition came from the ranks of local white farmers and land owners. You could be excused for thinking this was a simple case of NIMBY (Not In My Back Yard) on the part of a generally well-off community enjoying the natural and agricultural assets of the Karoo. And standing in the way of the national energy plan. But you would be wrong – on both counts. Phumelelo Booysen of the SCLC voiced his worry at how racism had been purposely brought in to divide anti-frackers. 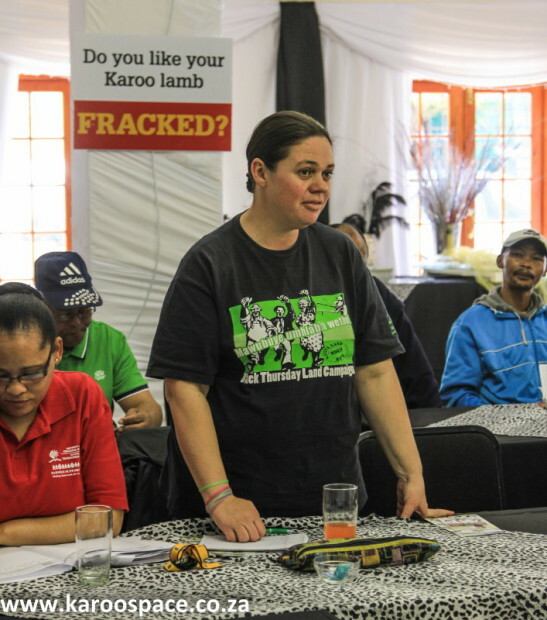 Fracking is everyone’s concern, and here in the Karoo a large group of emerging farmers and farm workers aligned with the Southern Cape Land Committee (SCLC) have taken a firm stand against this extractive – and potentially deadly – industry. “We have to change the perception out there, that the struggle against fracking is white peoples’ attitude against job creation. In fact it is for all who love South Africa, who care about future generations regardless of colour. Secondly, it is clear to most of civil society that renewable energy sources are the answer in the Karoo, which enjoys plenty of sun and wind. Fracking for gas (or oil or coalbeds, for that matter) threatens the precious underground water upon which hundreds of thousands of lives depend, on farms and in towns. Since 2011, anti-fracking sentiment has become a startlingly authentic expression of democracy in South Africa. It has grown steadily through all sectors of society. Bobby Peek of groundWork among MilieuDefensie activists. Treasure the Karoo Action Group (TKAG), Earthlife Africa, groundWork and the Climate Justice Campaign have held various demonstrations around South Africa. But there are many others too, ranging from large conservation organisations like WWF-SA and Birdlife South Africa to a range of religious groupings including the SA Council of Churches to rights groups like Afriforum and even quirky crowds like Bikers Against Fracking. There is broad cooperation between them. 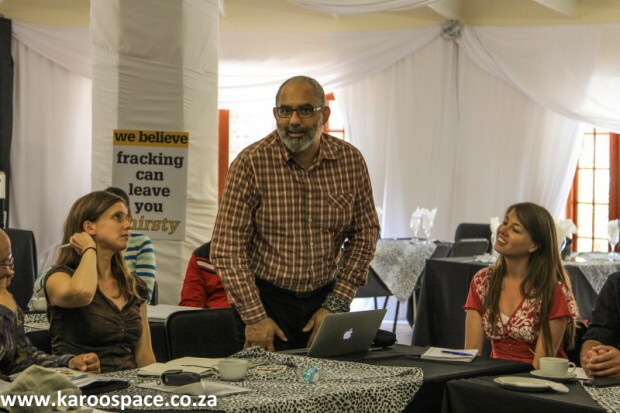 Sometimes there is closer collaboration, as there was at a recent workshop in Graaff-Reinet where the SCLC and an exciting group of Dutch anti-fracking activists, mostly from MilieuDefensie (Friends of the Earth) came together to share information and strategies on 19 August 2014. 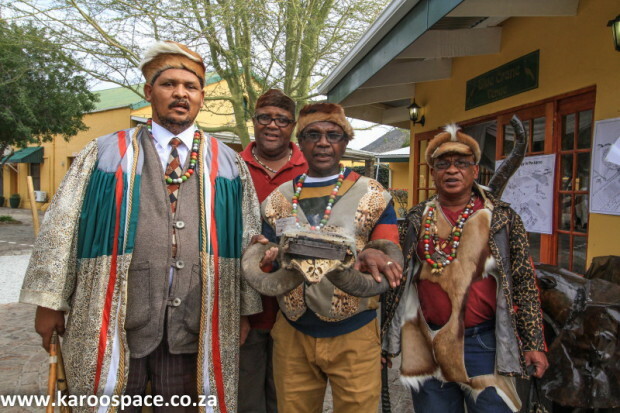 Daantjie Japhta, chief of the Khoi’s Inqua tribe (left), along with Inqua leaders Joey Dearling, John Mostert and Ali Andy Japhta. Also present were representatives from the local Khoi people, the Inqua. The tribe’s chief Daantjie Japhta stood up to explain the current Khoi position, especially in view of the fact that the First People are planning a land claim on large swathes of the Eastern Cape, including the Karoo. Jose Gil Paris of MilieuDefensie in the Netherlands stands to make a point. The Dutch shared news on how sustained pressure, town by town, had led hundreds of municipalities across the Netherlands to declare themselves “Frack-Free”. “It started with one, and then the municipality next door realised then they would probably be fracked, so they declared themselves Frack-Free and it spread from there. Now there are hundreds,” explained Ike Teuling, one of the MilieuDefensie campaigners. 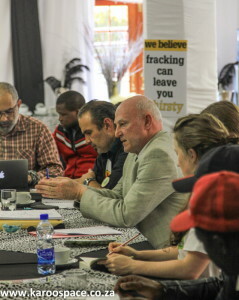 Derek Light (centre) was invited to give an update on the legal status of fracking in the Karoo. Graaff-Reinet lawyer Derek Light, who had been invited to give an update on the legal situation with fracking in the Karoo, said that working with local councillors and municipalities would be particularly valuable in the case of South Africa, since it is local authorities that have the final say on the rezoning of land that would precede shale gas exploration or exploitation. 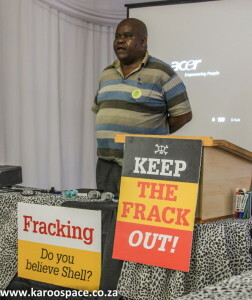 Anti-fracking task teams from small Karoo towns like Middelburg, Nelspoort, Rietbron, Steytlerville, Jansenville and Willowmore and others gave their feedback on Shell’s tactics and how many local politicians were pro-fracking, in sharp contrast to their constituencies. All except for one municipality, they said. 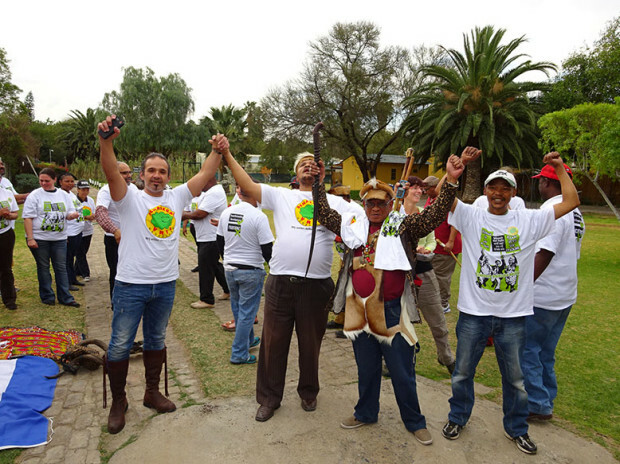 If it is true the Karoo has its first Frack-Free Municipality, it is not yet official. The SCLC, MilieuDefensie and groundWork have made available an easy-to-understand 25 page PDF on fracking in the Karoo, authored by Dr David Fig. Click here to have a look. 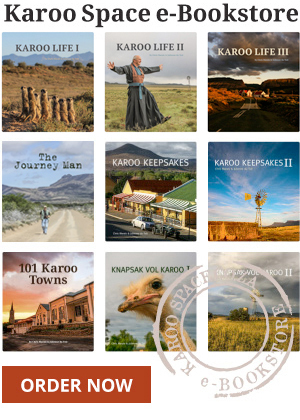 Julienne and Chris are authors of several print books and e-books focusing on the Karoo. 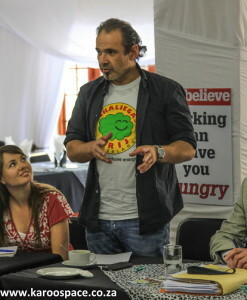 After the workshop, Karoo earth was mixed with Dutch earth, and anti-fracking t-shirts were swopped. Pic courtesy MilieuDefensie. Massive Karoo Shale Gas Study Begins The End of Karoo Fracking? Karoo Fracking: Falcon and the Angora Farmers Bundu Gas and Karoo Fracking Bundu, Falcon and Karoo Shale Gas Six Reasons the Karoo Will Not be Fracked Fracking vs Farming in the Karoo Are the Frackers Fracked? Great article – the opposition is widespread. Would like to hear Mr Chris Nissen and the pro-fracking Karoo Shale Gas Forum on this issue. They appear to pop up at forums where there is no informed opposition. Time to call on them to put their money where their mouth is.